Thank you for continuing to support Black History Month. I enjoy celebrating BHM on my blog because there are so many excellent Christmas episodes, specials, and TV movies with exceptional African-American cast members. There are also many outstanding or touching Christmas TV story lines aimed at black audiences. Throughout the month of February, I'll highlight a few of my favorites. The series was loosely based on the 1975 movie Cooley High. The 70s sitcom What's Happening!! was initially appealing to TV audiences because it was a then-rare glimpse into the lives of African-American teenagers. Who is your favorite character in this series--is it the ever-hungry Rerun? Raj's sassy little sister Dee? or the waitress Shirley? 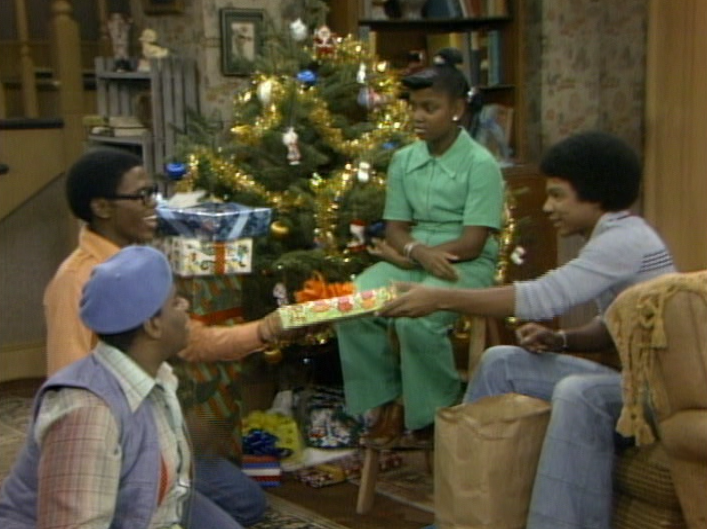 In the 1976 episode "Christmas," the friends exchange gifts. Left to right; Rerun, Raj, Dee, and Dwayne. The first season brought the episode "Christmas." Much like the title, it is a simple holiday story but one that continues to be meaningful for TV audiences. The episode begins on Christmas Eve with Raj and his friends exchanging Christmas gifts. 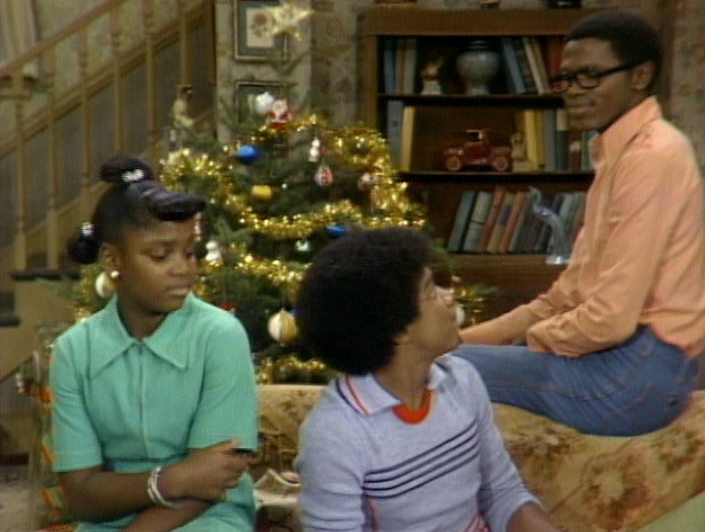 Raj explains to Rerun and Dwayne that he and his sister Dee will be alone, like they are every year on Christmas Eve and Christmas day, because their mother works. As a maid, Mrs. Thomas is able to make a lot of money on those two days because her employers host annual holiday parties. Dee to Dwayne while he hands out gifts, “If that one isn’t for me, I’m gonna deck your halls!" Both Dwayne and Rerun extend invitations to Raj and Dee to spend Christmas with their families, but Raj assures them that they like staying home and waiting for their mother to return late in the evening. When Raj and Dee's father Bill stops over to drop off Christmas presents, he too learns that his children are spending Christmas alone. Because their parents are divorced, Raj and Dee are used to spending Christmas with their mother. Though Raj and Dee would rather stay at home and wait for Mama, their father demands that his children spend their first Christmas with him. Bill Thomas (played by actor Thalmus Rasulala) begins to plan for a special Christmas dinner to share with his children and Raj shares the news with his mother. 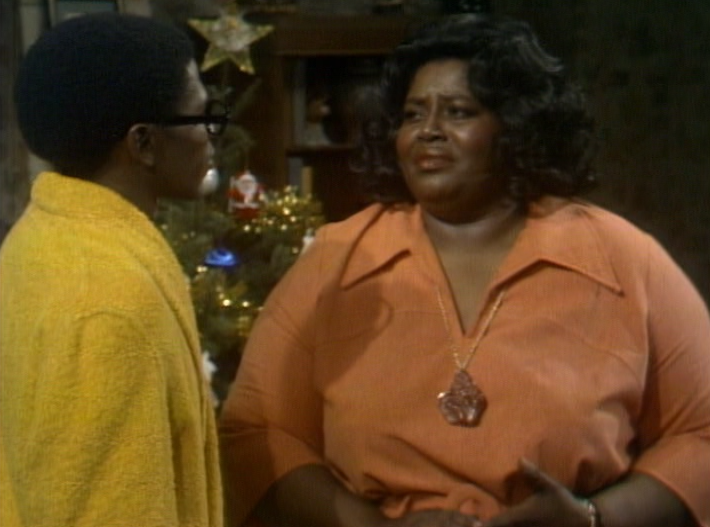 Of course, Mabel Thomas (played by actress Mabel King) is supportive and understanding--and she makes sure that Raj knows she wants him to have a good time with his father. Mabel is happy that her children will spend time with their father on Christmas. What Raj doesn't know is that his mother had been able to ask off from work on Christmas. This year, Mabel made the financial sacrifice to not work in order to spend time with her family. Now her children are spending the day with their father--and his girlfriend--and she will spend Christmas day alone. 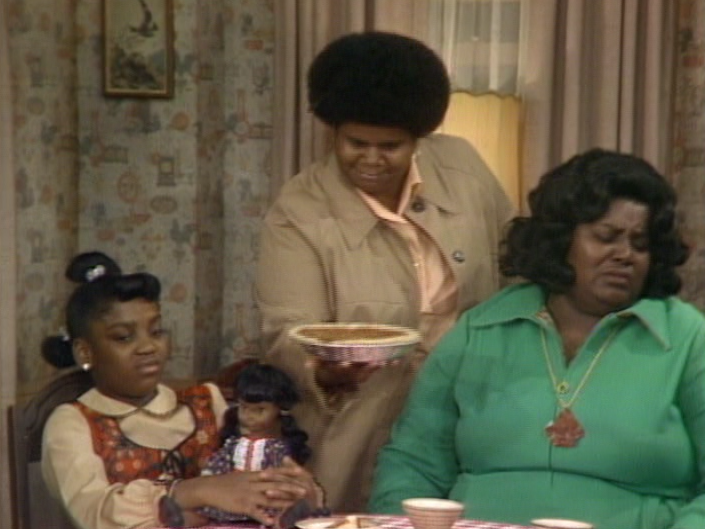 With their turkey dinner ruined, Raj suggests they eat dinner at the Thomas home. 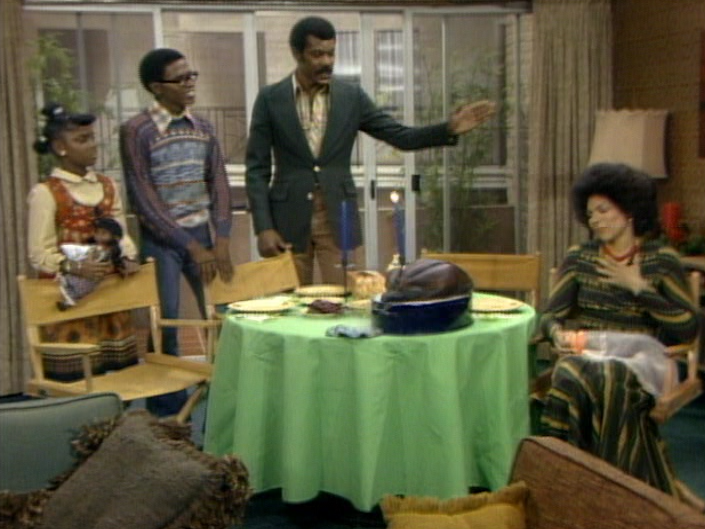 A twist of fate causes Bill's girlfriend (played by Rosalind Cash) to accidentally burn the turkey of their holiday dinner. 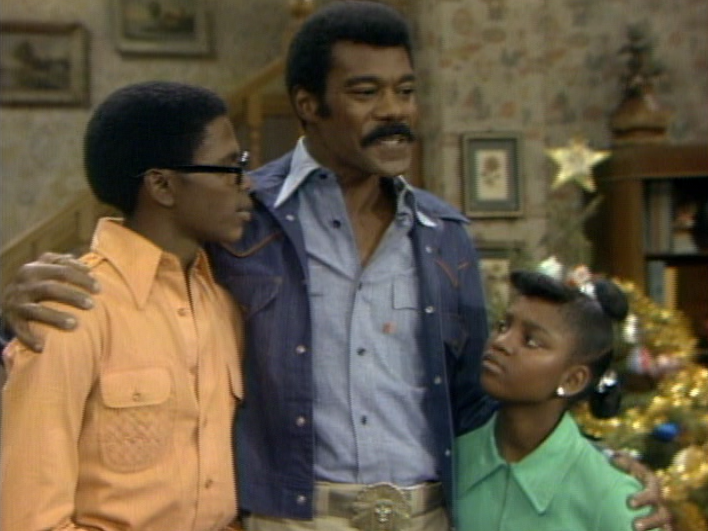 Raj suggests a solution: they can all go to the Thomas home to eat. He knows Mama has left a complete dinner at home and his friends have dropped off enough food for a feast. Sure enough, when Raj, Dee, and their father arrive back home, they find Mabel home alone. But Mama welcomes everyone--including Bill's girlfriend--to share the holiday meal with her. On Christmas, the family overeats to the point of turning up their noses at Shirley's homemade pumpkin pie! This story may be a simple one but stories about families coming together at Christmas time remain popular ones every year throughout TV. It's a traditional story that never goes out of style. While the heartwarming story may be familiar, the continuing appeal here is the funny cast of characters. 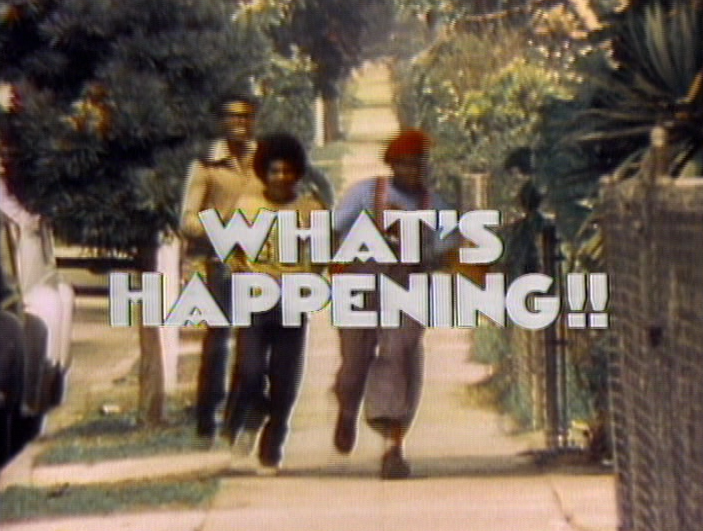 How long has it been since you watched an episode of What's Happening!! ?